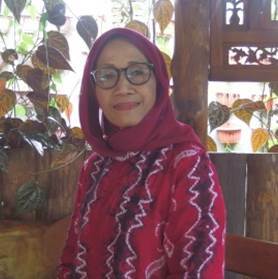 ﻿ Profile > Prof. Dr. Mangestuti Agil, MS, Apt. Prof. Dr. Mangestuti Agil, MS, Apt. Mangestuti, Subehan, Aty Widyawaruyanti, Syed Faisal Haider Zaidi, Suresh Awale, Traditional medicine of Madura Island in Indonesia, Journal of Traditional Medicine; 2007; 24(3); 90-103. Mangestuti Agil, Neny Purwitasari, Essential oil and Antimicrobial Activity of Essential oil from Ginger Rhizomes, Jurnal Bahan Alam Indonesia; 2009 Vol 6 No.6, 213 – 216. Mangestuti Agil, 2013, Herbal Medicine in Indonesian Culture: from Food to Cure, Asian Heritage Forum; 2013; Vol 1; 49-78. Burhan Ma’arif, Mangestuti Agil, Hening Laswati, Phytochemical Assessment on n-Hexane Extract and Fractions of Marsilea crenataPresl. Leaves through GC-MS, Trad.Med. J.; 2016; Vol. 21 (2); 77-85. Prof. Dr. Mangestuti Agil, MS., Apt.